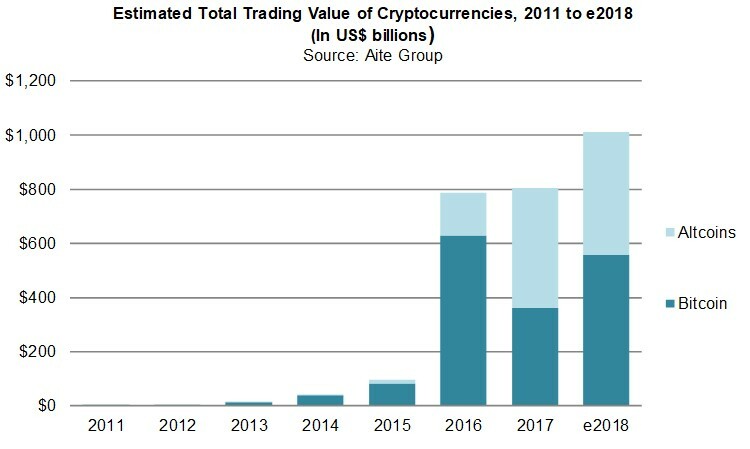 Aite Group forecasts the total trading value of cryptocurrencies to be just over US$1 trillion in 2018. Boston, July 11, 2018 – Bitcoin has failed to gain much attention and adoption for its original purpose, which is to serve as a digital cash payment system replacing the fiat currency payment system. But both trading volume and market cap of bitcoin have grown dramatically over the past few years and have led to an entirely new market of tradable instruments, which are collectively known as cryptocurrencies. With rapid price appreciation and an increase in total market cap, cryptocurrencies have quickly emerged into a new asset class that nobody can afford to ignore.